Years before Dorothy Gale plopped down in Oz right on top of that mean old stripey-footed wicked witch, a man — not just any man, but James Franco — accidentally found himself in the magical land, blown into a world of Technicolor whirlygigs and CG fairies by Sam Raimi. I mean, by a tornado. But as Raimi (along with surprise guests Michelle Williams and Mila Kunis) explained to the crowded Hall H audience Thursday at Comic-Con, his Oz won't have that much to do with the 1939 classic; for starters, those ruby slippers? Nowhere to be found. "It's the story of a selfish man. A bit of a lothario, a bit of a cad, not a great guy at first," explained Raimi of the fame and fortune-hungry Oscar Diggs (Franco), the small-time magician at the center of the Oz prequel. After landing in Oz and meeting three witches — Theodora (Mila Kunis), Evanora (Rachel Weisz) and Glinda (Michelle Williams) — Diggs uses his illusionist skills to pass himself off as a long-fabled wizard. As in THE wizard. Of Oz. The script (credited to writers Mitchell Kapner and David Lindsay-Abaire) culls information directly from L. Frank Baum's Oz books, but because of rights issues the ruby slippers made famous by Judy Garland could not be reprised in Oz. Not only that, the film won't feature the Tin Man, the Scarecrow, or the Cowardly Lion. 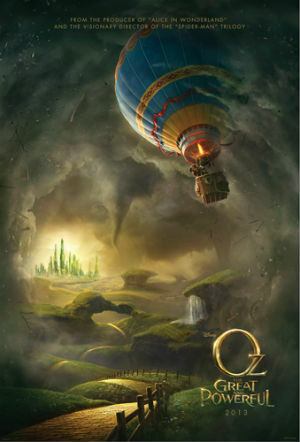 Oz: the Great and Powerful hits theaters on March 8, 2013.